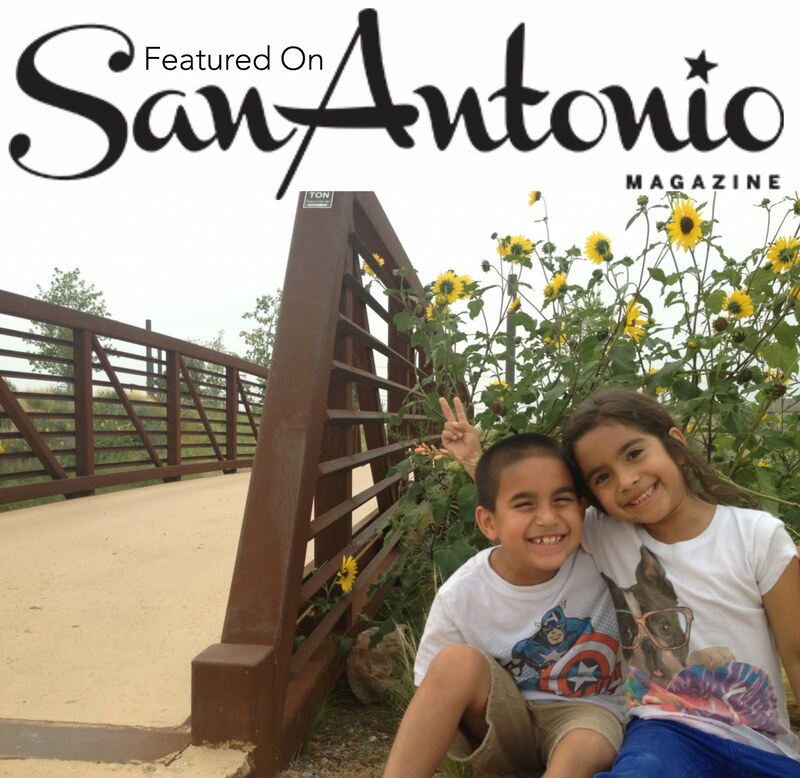 Traveling to San Antonio? 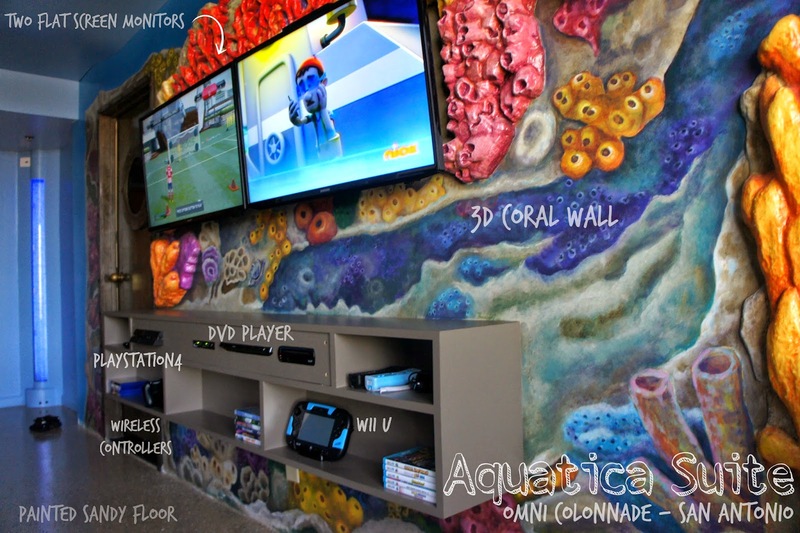 Get ready to see blue at the New Aquatica Suite at the Omni Colonnade! 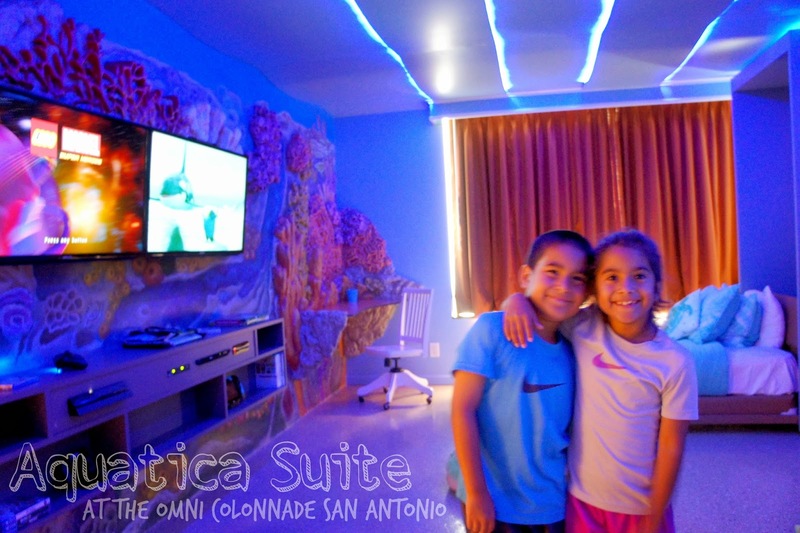 The suite came to life with the partnership of Sea World and is exclusively designed by an interior design graduate from The Art Institute of San Antonio. Now, I know that the above picture is a bit blurry, thanks to the blue lighting in the ceiling, but these smiles are so bright! 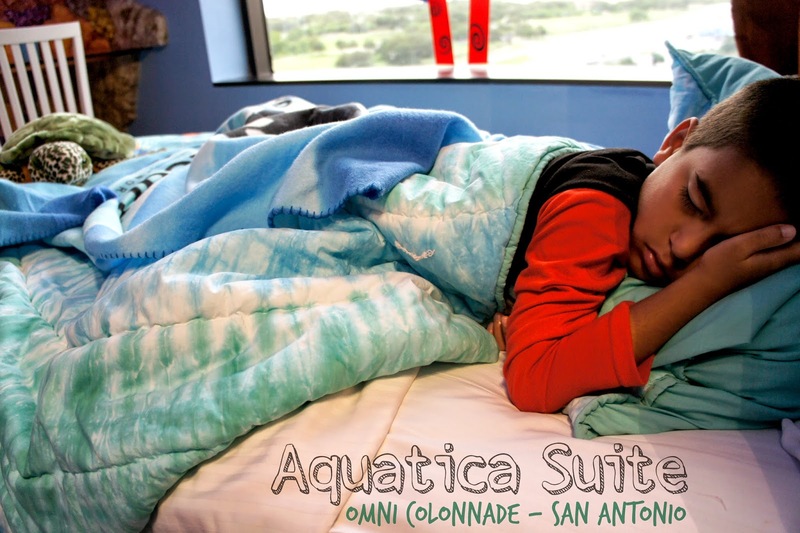 We recently stayed 2 nights at the Omni Colonnade and the Aquatica Suite has everything a family could want! From two flat screens, a PlayStation 4, Wii U, family friendly dvd's and video games, books, stuffed animals, board games and arts & crafts. 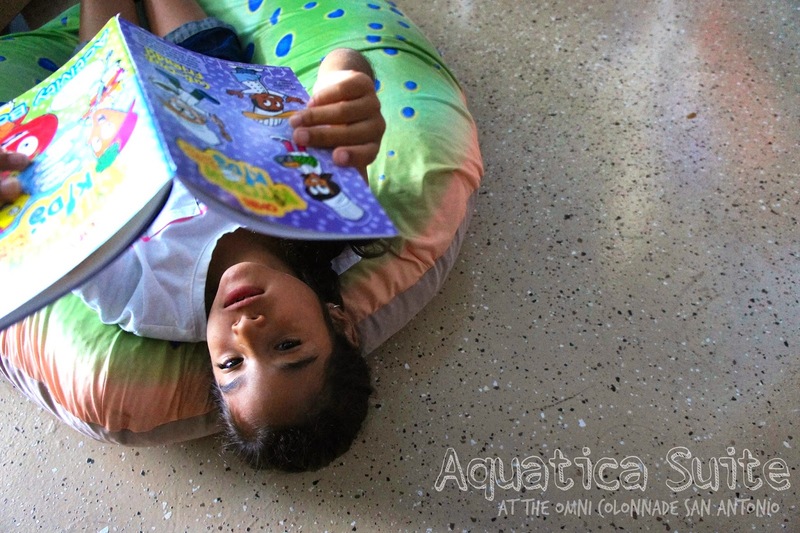 With live fish swimming in a salt water aquarium that goes from the bedroom to the bathroom, these little ones really felt like they were underwater. And get ready for a bunch of "Arg, mateys!" and "walking the plank" talk, when they see that door with a porthole. The door leads to the adult room and you are able to peek in on the kids from the other side. Because the Omni Colonnade knows you cannot plan a trip to San Antonio without visiting Sea World, they have a huge map of the Aquatica, the waterpark located inside the amusement park. My children loved this bubble chair to play video games with the wireless controllers and lounged on the two large stingray bean bags on the painted sandy floors. 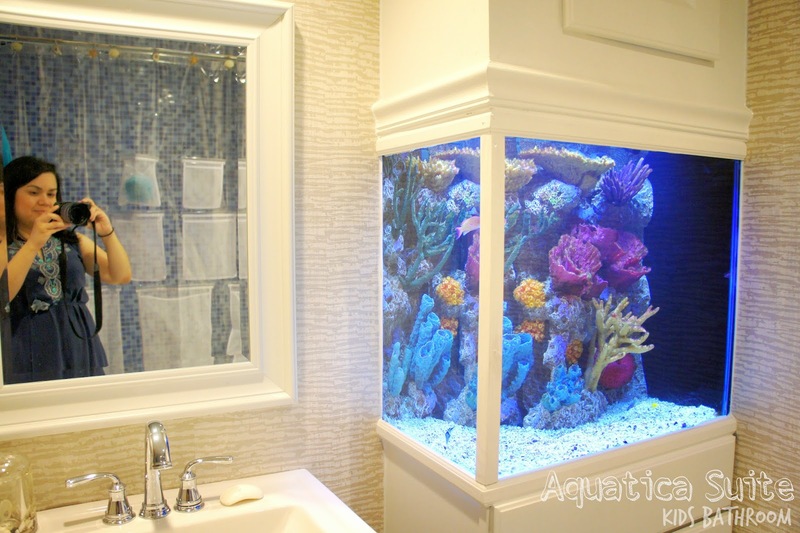 Even the bathroom gets oohs and ahhs! It's equipped with special Aquatica towels and rubber duckies. 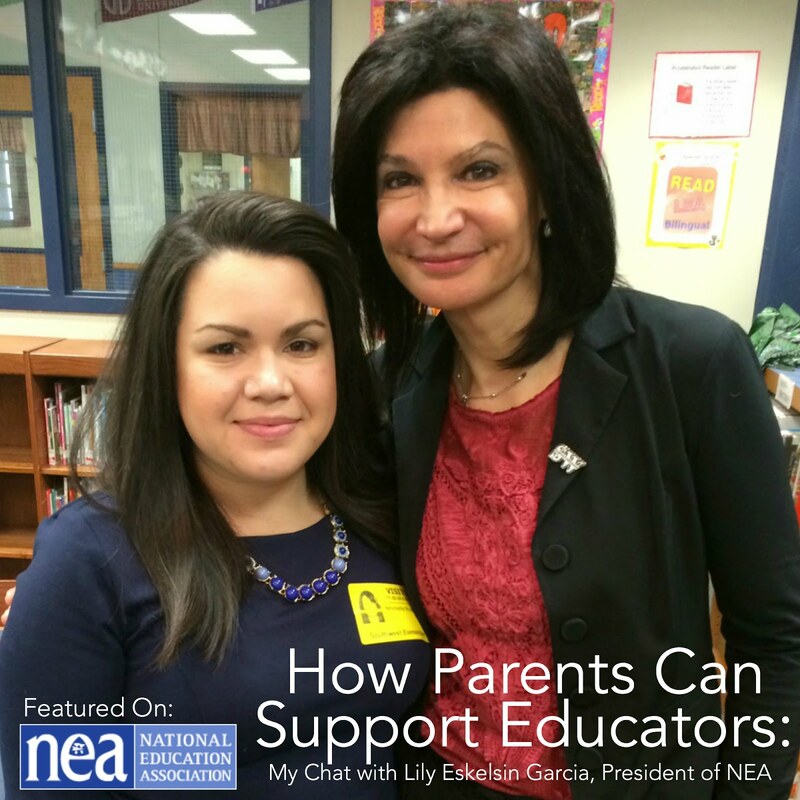 But don't worry parents, you are not ignored at all! 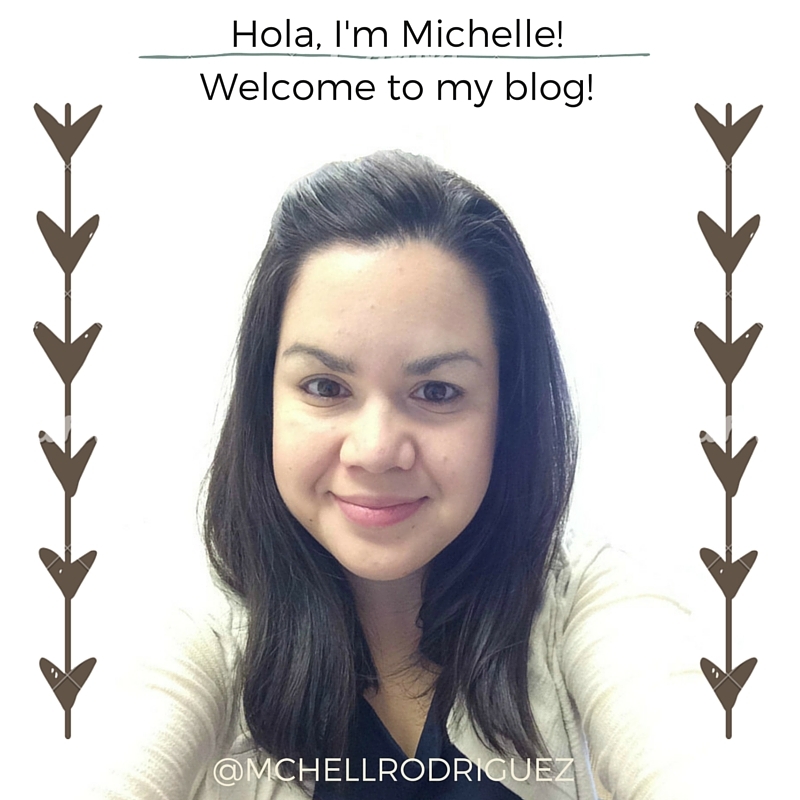 This bed was completely comfy and both my husband and I work up feeling so rested! The suite also comes with a nice size living area with a fold out sofa bed, just in case you have abuela or an extra cousin on the trip with you! The entire suite can accommodate 5-6 people. 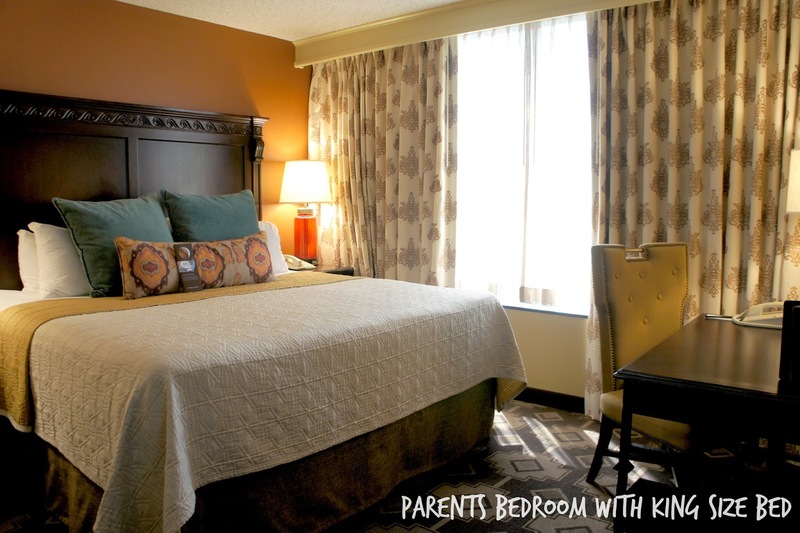 When it comes to a stay cation, we love a hotel where we don't have to leave at all! The kids just wanted to swim, play in their room and eat and we were completely okay with that! I will tell you that you all will get much needed rest and relaxation! 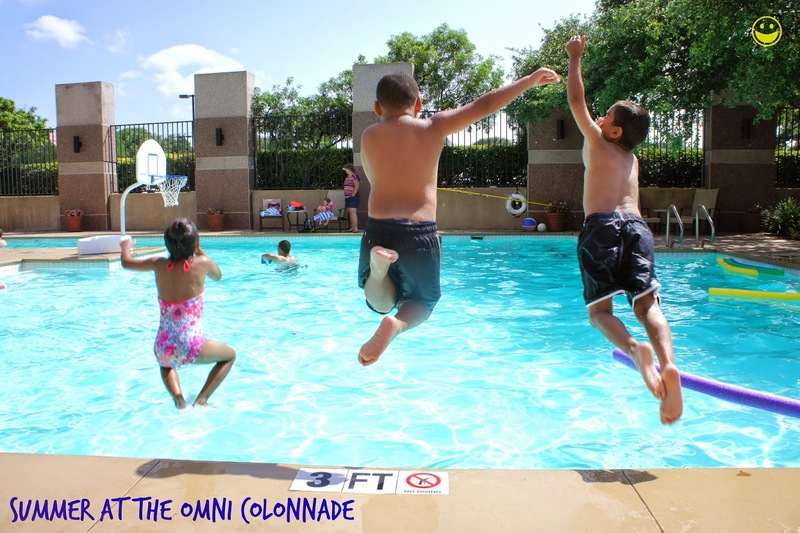 What makes the Omni Colonnade in San Antonio so special, is that they are so family friendly. 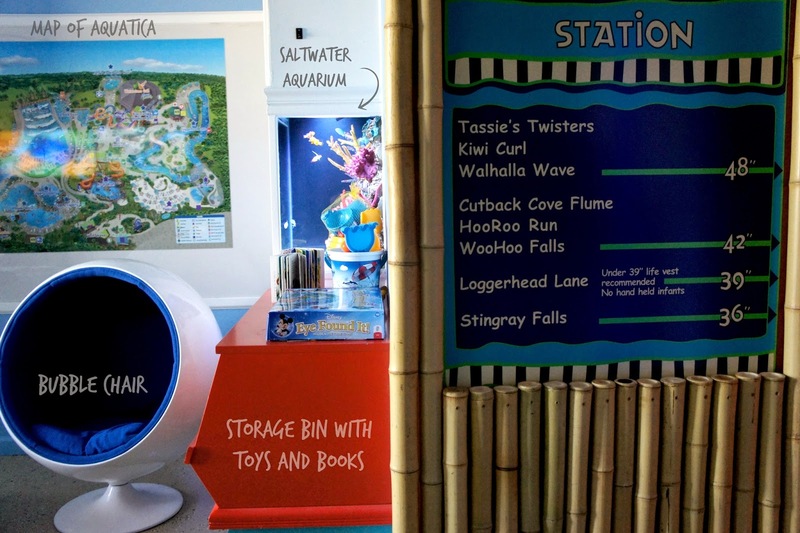 Not only is there an Aquatica Kid Suite, there is also a Kids Fantasy Suite available. 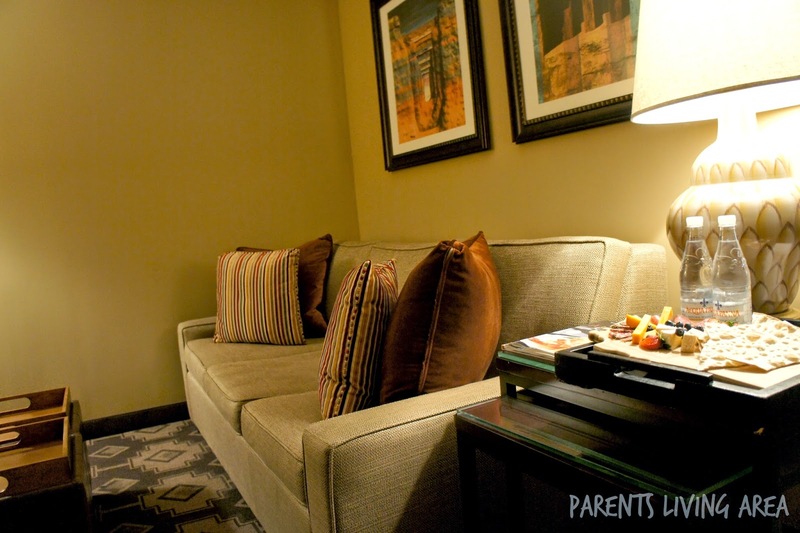 To see what that suite looks like, check out our review post from a couple years back! Omni is really our go to for family friendly travel, we couldn't be happier with our experience! The kids left feeling so special and with great memories, it was such a great reward for a job well done in school! And for once, we came back so rested from a family vacation! I hope summer has started out great for you and your family. Any big plans?